Government Adda 247 Maharastra Mumbai MCGM Recruitment for 41 posts. MCGM Recruitment for 41 posts. बृहन्मुंबई महानगरपालिकायेथे ‘समन्वयक’ पदांच्या एकून 41 जागांसाठी भरती. 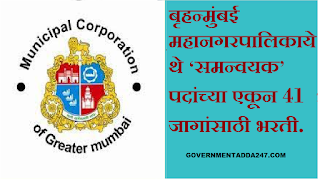 Municipal Corporation of Greater Mumbai, Public Health Department – MCGM Recruitment 2018, MCGM Recruitment has released the notification for the recruitment of various posts. 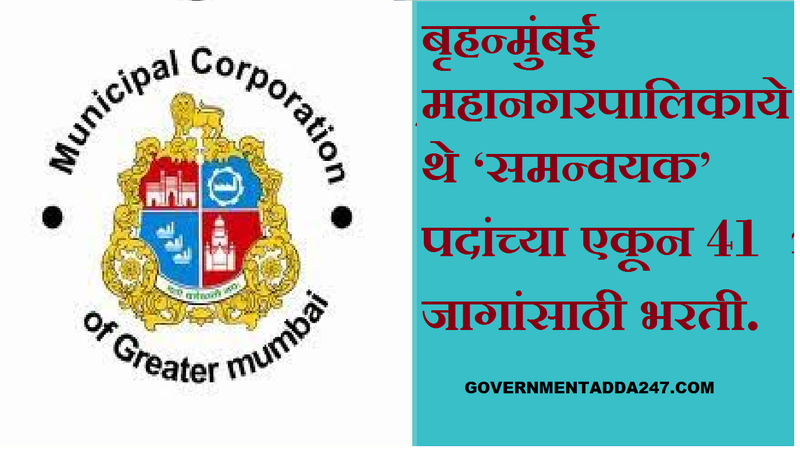 MCGM recruiting for total 41 vacancies of coordinator posts. The last date to submit an offline application is 27 September 2018. To know more about MCGM Recruitment check the information which is provided below. उमिद्वार ने सार्वजनिक आरोग्य संस्था नागपूर/एचएफडब्लूटीसी, नाशिक या औरंगाबाद से 18 महिनो कि पढाई मी उत्तीर्ण होणा चाहिये. आयु सीमा : न्यूनतम: 18 साल, अधिकतम: 38 वर्ष, यानी एक उम्मीदवार का जन्म 02.08.1980 से पहले नहीं हुआ होणा चाहिये और 01.08.2000 से अधिक नहीं (दोनों तिथियां सम्मिलित). ऊपरी आयु सीमा अनुसूचित जाति / अनुसूचित जनजाति 5 साल, अन्य पिछड़ा वर्ग 3 साल, विकलांगों को 10 साल, पूर्व सैनिक को 5 साल. MCGM Recruitment 2018, The offline applications are inviting from the eligible and interested candidates who qualify the eligibility criteria. Those candidates who are eligible can apply from 24 September 2018 and the last day to submit an application is 27 September 2018 after this date application will not be accepted. Candidates have to submit an application by mailing via post to the respective address. The eligibility criteria for the post is aspirants must qualify in 10th class and Sanitary Inspector Exam Pass, MS-CIT OR equivalent. Every aspirant who secured more marks will be considered in the Open category. The backward class can apply in the open category. The backward class who secure more marks in the examination will be considered in the Open category. Those candidates who apply for this post have to present at Office of the Deputy Executive Health Officer (Family Welfare and Mother-Child Welfare), Room No. 13, 1st Floor, F / South Department, Dr. Babasaheb Ambedkar Marg, Parel, Mumbai 400012 this address for Document Verification.